To receive payments via SEPA Direct Debit, merchants have to get an authorization from the debtor. In this context, the signed SEPA mandate represents the authorization, whether it is signed on a paper or electronically. 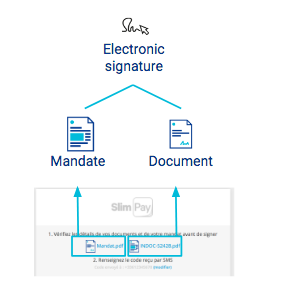 SlimPay has developed an electronic signature module, complying with EPC (European Payment Council) rules and the eIDAS regulation for the SEPA mandate signature. In this article, we will go through the main features of SlimPay electronic signature module and all the possibilities that it offers to optimize the subscription journey. Today, the customers’ purchasing journey is multichannel, as they want to be able to go from one channel to another, in a streamlined way and with a harmonized experience no matter what channel they are using. SlimPay is aware of this challenge for merchants and developed a multichannel solution that easily adapts to all points of interaction between merchants and their clients while improving the conversion rates. Web or mobile : SlimPay solution is web-responsive, which enables consumers to simply sign documents or mandates via their PC, mobile phone or tablet. Call center : It is also possible to sign a document or mandate by delegation, with the help of an agent. The client gives his consent over the phone and the agent does the signature on behalf of the client, who then receives a copy of the signed mandate or document. Face to Face: Of course, shopping in store still represents an important rate of total sales. That’s why SlimPay has thought the solution to also adapt to this channel to allow salesperson or agents in the store or in mobility to make their customers sign for documents or SEPA mandates. According to the sector and the sensitivity of some contracts, the type of signature can be adapted in order to efficiently protect your activity from potential fraud attempts and disputes. However, merchants also need to keep in mind that the subscription journey has to be frictionless in order to increase the conversion rate and client satisfaction. That is why SlimPay has developed an electronic signature module with three types of signatures in order to better adapt to each use case and offer the best client experience. For more details on SlimPay’s types of signature, read the article dedicated to this topic on our Help Center. For example, subscribing online to an insurance requires not only to sign a SEPA mandate for future monthly payments, but also to sign a contract. In similar use cases to the one described, offering a simultaneous signature of the contract and the SEPA mandate brings more fluidity and simplicity to the user experience. In order to propose a frictionless subscription journey, SlimPay has developed the simultaneous signature of SEPA mandate and documents on the Checkout. 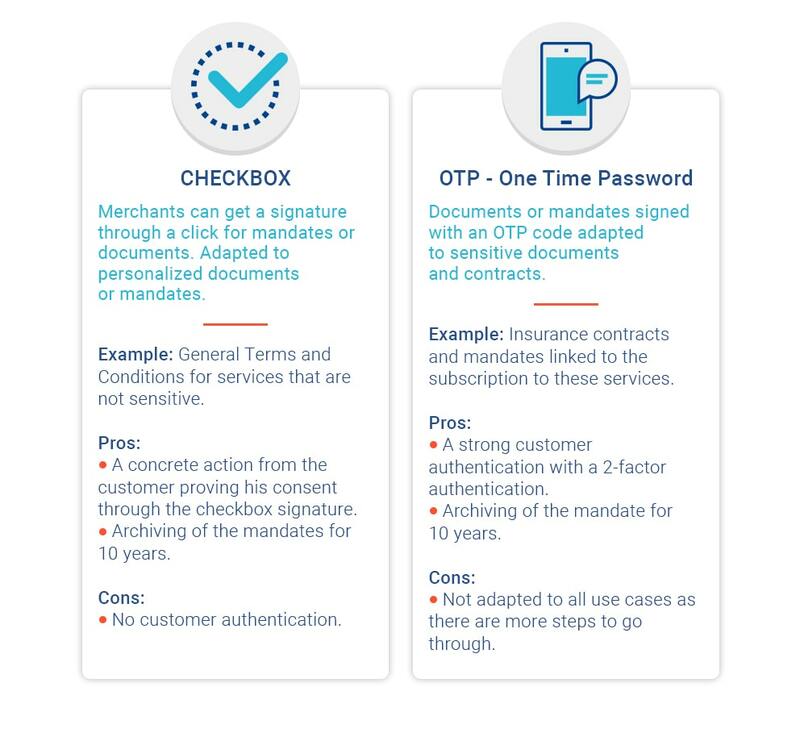 At the end of the subscription journey, the client can check the content of the mandate and the document, before signing them both with a unique electronic signature. Once the client has made the signature, a certificate in the name of the client is generated, an electronic signature is affixed on the mandate and the document, and a timestamp token is delivered by the certified timestamping authority. Eventually, a body of evidence is automatically generated, which will allow merchants to prove the consent of the client in case of dispute, with a certain number of elements like the name and surname, the characteristics of the signature, the identification data of the client, etc. Learn more about the different use cases and subscription journeys that SlimPay’s solution can support on the video dedicated to the insurance sector.